Early on, in the first few weeks of being here in Sydney, when Daniel and I were staying in a rather luxurious apartment in Surry Hills and I was getting used to the life I wasn't about to lead, one of our most unexpected moments occurred when walking down neighbouring Oxford Street at dusk. (As a digression, before I tell you what this astonishing occurrence was, there needs to be some etymological explanations for those back home in London. After all...firstly, for goodness sakes, you'll be asking yourself, can't the Australians come up with their own place and street names? And secondly, if they are going to poach ours can't they at least spell them bloody correctly? Surry Hills? Where's the frigging 'e'? (oops, they swallowed it all at Mardi Gras...) Surry Hills does have some residual similarity to our dear old county Surrey in that it boasts some ridiculously over-priced boutiques frequented by people with more money than sense. There is also an air of Home Counties wafting about: tattoos are definitely verboten (rather than de rigeur) and no-one would bat an eyelid if you decided to canter down the main street on a smart looking horse. As for neighbouring Oxford Street it is the spitting image of London's. Similarly tawdry, similarly derided in the national and local press, and similarly long. Nevertheless, isn't it time Sydney just had an enormous re-naming ceremony?) Anyways, back to the point. As we walked down Oxford Street in search of somewhere to eat we looked up into the lowering sky (it was about to rain) only to see hundreds of enormous bats flying past, classically silhouetted against the waning moon. We were in a Hammer Horror movie and it was magical. 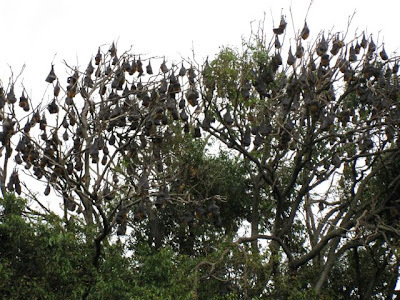 hundreds upon hundreds of restlessly sleeping, intermittently squawking, to high-heaven reeking flying foxes. And what we witnessed on Oxford Street was their nightly migration in search of food (fruit, not blood...). They are causing endless problems to the Botanic Gardens and there are subsequent endless discussions about what to do with them. It seems that there is a new solution posited every week in the Sydney Morning Herald. Personally, I hope that they take over the world. There is nothing better of a night that to look up into the sky and see an enormous flying mammal. One with extraordinary skills. Every time I do so (and that's most nights, what with the ever-demanding Sniff pleading for midnight walks) it gives me a thrill. It's Dracula and Christopher Lee and exotic nights and palm trees and diversity and extraordinariness and everything good about Sydney. Jealousy grows here in Amsterdam! The pic is beautiful Jonathan!!!! !